Well, no. Obviously. That isn’t the end of this article; some madness must have prompted such a ridiculous title. Neuroscientist, Craig Bennett, purchased a whole, Atlantic salmon, status: very much dead, and took it back to the lab for some routine questions and a brain scan in an fMRI machine. The salmon was shown a series of photographs depicting human individuals in social situations with a specified emotional valence. 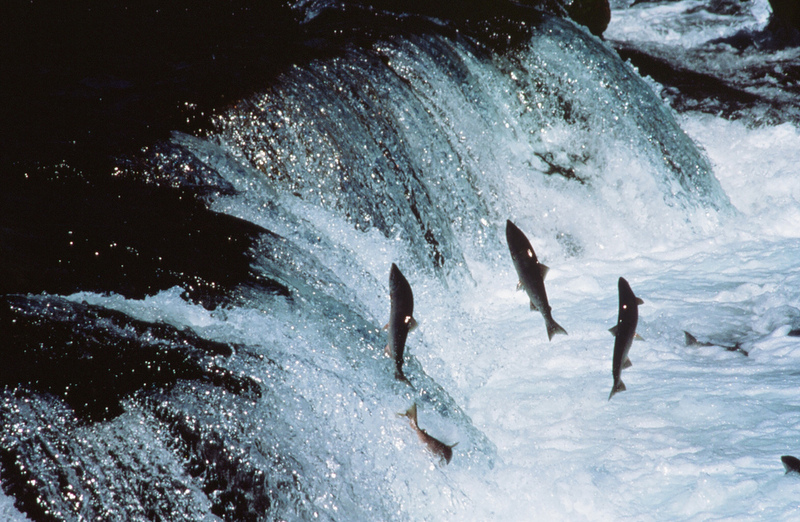 The salmon was asked to determine what emotion the individual in the photo must have been experiencing. The salmon didn’t answer any of the questions, but when plopped in the scanner its brain lit up in regions that indicated neural activity. 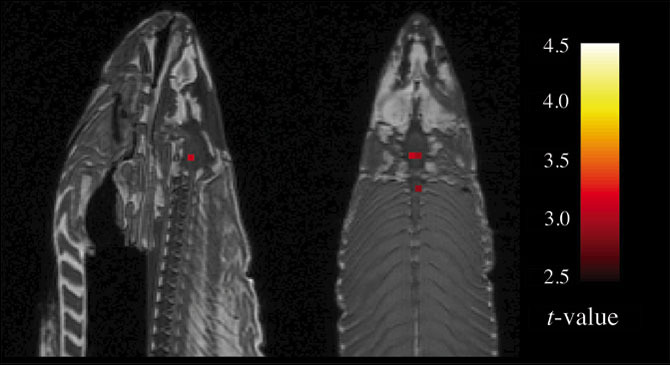 The fMRI scan of the dead salmon. The story itself is ridiculous, but the results are of great significance. fMRI (functional magnetic resonance imaging) is used primarily to map blood flow around the brain. The idea is that when a particular part of the brain is used, blood flows to it, and this region lights up on the scan. Naturally, If the object being scanned is dead, there should be no blood flow to the brain at all. So what’s going on? The salmon hasn’t gained sentience and is trying to talk from the other side. fMRI has a drawback, and that is that the data has a lot of background noise. To the extent that a region with no blood flow can mistakenly show up as receiving blood. This doesn’t make the technique worthless but highlights how medical imaging is a subtle art as well as a science. To make results reliable, doctors and scientists can’t make conclusions from a single result, but instead an amalgamation of results. But the story goes much deeper than one dead salmon. Apaper publishedby another team cracks open a long-overlooked and concerning bug in the code used to examine fMRI results that created a lot of false-positive signals. A bug that hasn’t been spotted for over 20 years. So how did the team from Linkoping University, Sweden, find this result? They took over 1,000 fMRI scans from patients who were resting. When a subject is resting there shouldn’t be any significant change in blood flow around the brain. Whereas if a patient is moving an arm or imagining a memory then blood would flow to the part of the brain associated with that action and light up. The different types of software tested each claim that there should be a false positive rate of 5%, so the researchers would have expected that in 5% of cases there would be signs of blood flow where there was none.